So I finally made it to Publix to shop the current sale ad. As you can probably tell from my photo I basically just focused on BOGO deals with a few basics or couponed deals as well. I was loving the items on BOGO this past week and I am just as excited for the BOGO deals in next week's ad too. We will be kicking off our own personal "find the bottom of the deep freezer" challenge here in the next week or so because I just placed our Zaycon order for 40! pounds of boneless, skinless chicken breasts. We plan on packaging it ourselves in managable portions to freeze so that means that I will need to have room for it all by the end of March. Since I can currently barely shut the lid to our deep freezer, we have quite a task ahead of us. I imagine we will be amazed at what we find in there and I know that I will need to get creative/flexible in order to cook and use all of our proteins, frozen veggies, breads and so much more. Stay tuned for our adventures in this quest in the weeks ahead. 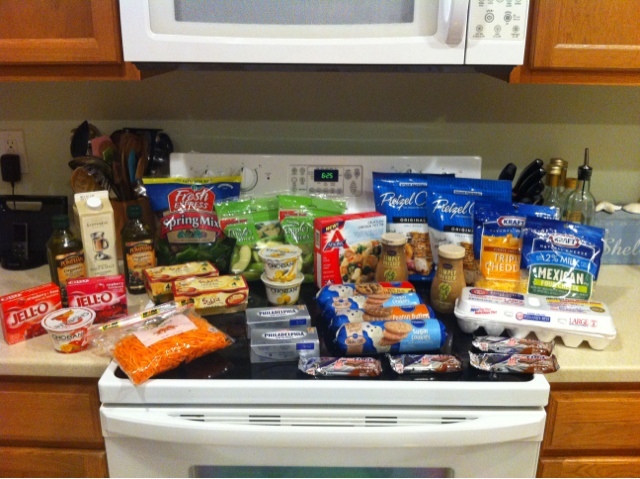 I spent just over $60 before coupons so I did get to use two $5/$30 Winn Dixie coupons with the rest of my coupons. I am sure you are wondering about the 4 rolls of Pillsbury cookie dough. Fear not, I have not stopped baking from scratch but I have a fun post using them coming up soon! Make sure you check back on Thursday for my weekly totals link up as well as my shopping trip for the first day of the new sale ad! I would love to save more than I spend, but we don't get deals like these here in NC.